Santa Cruz Bike Tours makes riding fun and easy. From the Monterey Bay coastline to the redwoods, we take you to unique and beautiful places you may not have otherwise discovered. We supply bikes, helmets, water, snacks, binoculars and full support for your ride. See the sights from Steamer Lane to the historic coastal farm at Wilder Ranch, and ride along some of the most gorgeous coastline around. Pelicans and sea lions await you! Also, the Monarch Butterflies are returning to Natural Bridges State Beach. Come visit the beautiful Monarch Butterfly Habitat, where rangers and docents, armed with binoculars and telescopes, will tell you all about this beautiful creature. From our Santa Cruz Coastal Cruise for the whole family to our Best of the Redwoods for experienced mountain riders, we have a ride for you. 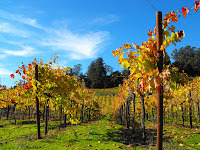 Our Brewery and Winery Tours feature the finest beers and wines of Santa Cruz County served with leisurely rides along the coast or through the redwoods. We can accommodate groups of most sizes for a day of sightseeing, fun and fitness. From the coast to the redwoods, custom tours & team building. Experience the scenic trails inside the Forest of Nisene Marks in Aptos on bike and on foot. See historic sites and enjoy lunch at your destination, beautiful Maple Falls. At Santa Cruz Bike Tours, we offer eco tourism at its best: guided sightseeing bicycle tours and mountain bike adventures for most skill and fitness levels on some of the finest, most scenic trails in Santa Cruz County and California's Central Coast. We look forward to sharing these trails with you, and as your hosts, we will do all that we can to make your Santa Cruz Bike Tour a great one. So whether you live in or are coming to Santa Cruz or San Francisco, San Jose, Oakland, Santa Clara, Los Altos, Palo Alto, Mountain View, Sunnyvale, Los Gatos, Gilroy, Salinas, San Juan Bautista, Carmel or Monterey, you are no more than 90 minutes away from making Santa Cruz Bike Tours part of your next California eco tour. Join us for cycling fun on the coast and in the redwoods. Your Santa Cruz Bike Tour includes bikes, helmets, water, snacks, binoculars, and handlebar bags. See you soon! Ride the scenic Santa Cruz coast to Wilder Ranch. Easy pace with stops at famous featured attractions. Daily by appointment. Bikes, helmets, water, snacks, sunscreen, binoculars, and handlebar bags provided. Less $10 w/own bicycle & helmet. A Santa Cruz Bike Tour is a fun and healthy gift. Choose a specific tour or simply a dollar amount. Go by and see our friends at the Seabright Brewery Pub & Restaurant after your ride for great beer, food, and fun. Ride with Santa Cruz Bike Tours, and the first beer is on us!